Estabilished in 1965, Alvarez Guitars has been one of the leading acoustic guitar brands in the U.S.A. and around the world for nearly 50 years. Alvarez instruments are known for their tone and feel and some of the most amazing artists over the last five decades have gravitated towards the brand and its guitars. Founded in 2002, Faith Guitars are the passion of a small team of seasoned guitar experts based in Shropshire, England and led by world-renowned British luthier, Patrick James Eggle. Faith has been elected the UK's "Best Acoustic Guitar" for the past three years because of the incredible craftsmanship, all solid wood construction, and attention to detail that produces incredible sound quality, great fit & finish and superior playability. All the things you'd expect from a world-renown luthier and a team of seasoned artisans. Lakewood guitars are proudly crafted by hand in Giessen, Germany. Founded in 1986 by renowned guitar builder Martin Seeliger, these instruments are built to the highest, most exceptional standards. Acus conceives, designs and manufactures its entire line of products exclusively in Italy at Recanati, drawing upon the highest level of expertise available from a centre of history and tradition in the development and manufacture of musical instruments in Europe. Acus’ mission is a sound design that amplifies acoustic sound with clarity, purity and natural tone. Founded in 1980, Palmer Germany has established itself on an international scale as one of the best known secrets of the music and audio industry. The sophisticated design of high-quality, self-produced Palmer transformers is based on their solid expertise and more than 30 years of hands-on experience in audio technology and amplifier production. Nektar Technology was founded in 2009 with a mission to bridge the gap between powerful music software and controller hardware, and to create transparent and intuitive tactile products for control and operation of music software as if it is hardware. Founded on a promise of affordability, durability and innovation, On-Stage Stands products are used everyday in studios, showrooms, and on stages everywhere. 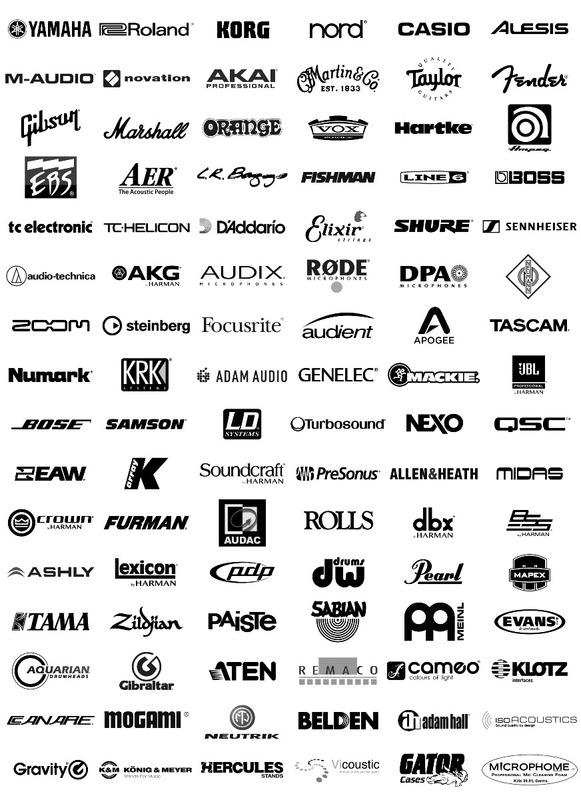 Over the years, the brand has grown to include over 300 products in 8 different categories: Guitar, Microphone, Keyboard, Workstation, Rack/Amp/Mixer, Speaker, Lighting, and Band & Orchestra, changing the way musicians display, support, and protect their prized instruments and equipment. Fluid Audio was founded by loudspeaker engineer, musician and recording enthusiast Kevin Zuccaro. Working on speaker drivers, hi-fi systems and cinema projects gave him a well-rounded approach to speaker design. Leaving M-Audio in 2011, Kevin Zuccaro founded Fluid Audio. MXL is a leading manufacturer of professional audio products for the music recording, broadcast, post-production and live sound markets. These professional mics deliver high quality sound on par with far more expensive mics. MXL debuted in 1998 under American company Marshall Electronics.